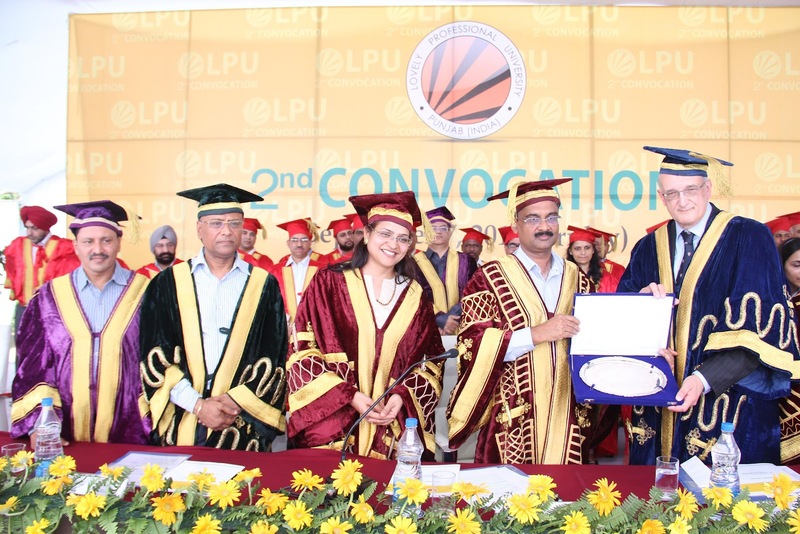 Jalandhar: LPU organized its 2nd Convocation, the largest ever convocation in the University campus, to confer M Phil, Post Graduate, Graduate Degrees and Diplomas. Over 7600 students, of the 2011 batch of both LPU and Lovely Institutes were awarded with Degrees/Diplomas for their academic achievements. Chief Guest of the Day was Professor Sir Leszek Borysiewicz, the Vice Chancellor of the University of Cambridge, and one of the greatest academicians of the world. The event was presided over by LPU Chancellor, Mr Ashok Mittal. Among the 7600 students, who were awarded degrees; 27 students were awarded with Gold Medals, 86 with Batch Toppers Academic Honors & 60 students got M.Phil Degrees. The event also saw one of the largest academic processions, constituted of 200 academicians of the University, which was led by Hon’ble Prof Sir Leszek Borysiewicz , escorted by Chairman Lovely Group Mr Ramesh Mittal, Vice Chairman Mr Naresh Mittal, LPU Chancellor Mr Ashok Mittal, Pro Chancellor Ms Rashmi Mittal, Vice-Chancellor Dr Ramesh Kanwar & Director General HR Singla. Chancellor Mr Mittal delivered the welcome address and also briefed about University’s research accomplishments including numerous publications, academic & sports achievements, strength of University in IT domain, tie-ups with numerous international universities, and vast diversity of campus that is represented by students coming from 26 countries of the world. The Chancellor mentioned, “Though lot has been achieved in a short span of time but expectation of society from us is still very large. The University’s next goal is to excel in the area of research and innovations for the betterment of society and we have already started making progress in these areas. He said “The University has accelerated its journey towards excellence and will surely achieve its goal of Transforming Education Transforming India.” He further congratulated the graduating students of the university and urged them to promote the vision of the university and contribute to society after passing the corridors of LPU. Dr Ramesh Kanwar, Vice Chancellor, LPU read the annual report where he mentioned: “LPU Faculty relentlessly strives in instilling ethics and good human values in our students so that they become globally competitive professionals and good citizens of the society to solve 21st century problems of the world dealing with water, food, energy, health, infrastructure and sustainability.” In his report DR. Kanwar gave a special mention on the faculties 250+ research papers which have been published in national and international journals. Also, he mentioned about the research grants received from bodies like DRDO, Punjab State Council for Science & Technology and Center for International Co-operation in Science etc. He gave details about the consultancy projects which have been taken by faculty with corporate like Coca Cola, Next Care, Videocon, Mind Clinic and patents that have been published in more than 140 countries. The Honourable Guest, Professor Borysiewicz also bestowed honour upon and distributed medals to the meritorious students, for their illuminating scholastic achievements. This followed the exhortation ceremony wherein the newly degree-holders vowed to work towards the betterment of the society. The convocation ceremony came to a close with the National Anthem. Guys, due to this guide it's easy to write a scholarship essay. Just check it out!